Tindfjallajökull is a stratovolcano in the south of Iceland. It has erupted rocks of basaltic to rhyolitic composition, and a 5-km-wide caldera was formed during the eruption of the 54,000-year-old Thórsmörk Ignimbrite. It is capped by a glacier of 19 km². Its highest peak is Ýmir (1462m), which takes its name from the giant Ýmir of Norse mythology. The most recent eruption was at an unknown time in the Holocene. The name means "Tindfjöll glacier". 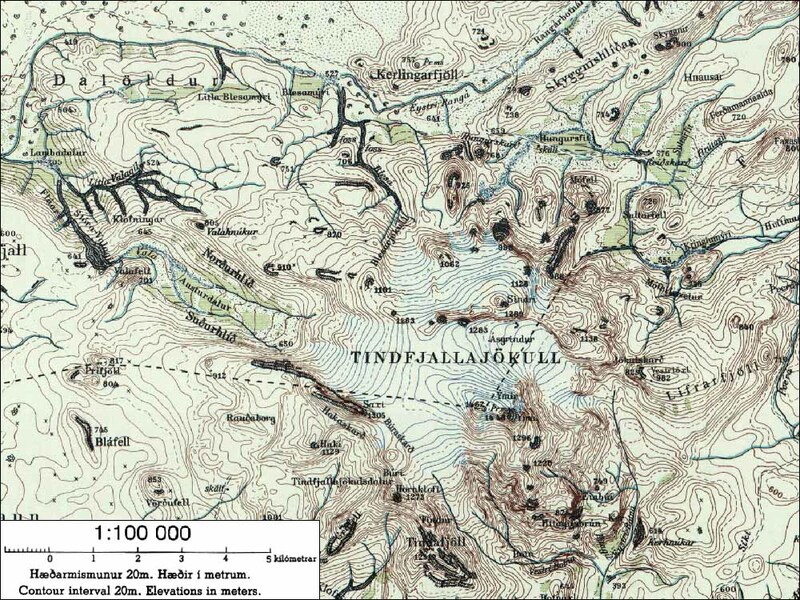 Tindfjöll ("peak mountains") is a ridge that extends to the south of the glacier. The rivers that flow from the glacier are Hvítmaga to the north-east, Gilsá to the south, Þórólfsá to the south-west, Valá to the north-west and Blesá to the north. Hvítmaga, Gilsá and Þórólfsá drain into Markarfljót while Valá and Blesá drain into Eystri Rangá. ^ a b "Tindfjallajökull". Global Volcanism Program. Smithsonian Institution. Wikimedia Commons has media related to Tindfjallajökull. This page was last edited on 2 July 2018, at 15:05 (UTC).